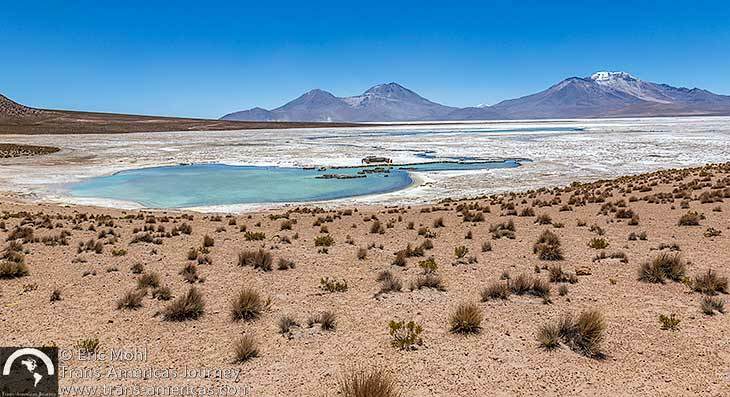 Sure, you could travel between Colchane and Putre in Northern Chile using the perfectly good highway, but this Epic Drive is not only much shorter, but the detour takes you through three different parks and includes hot springs, vicuña, and flamingos. Oh, and border smugglers and armed soldiers. 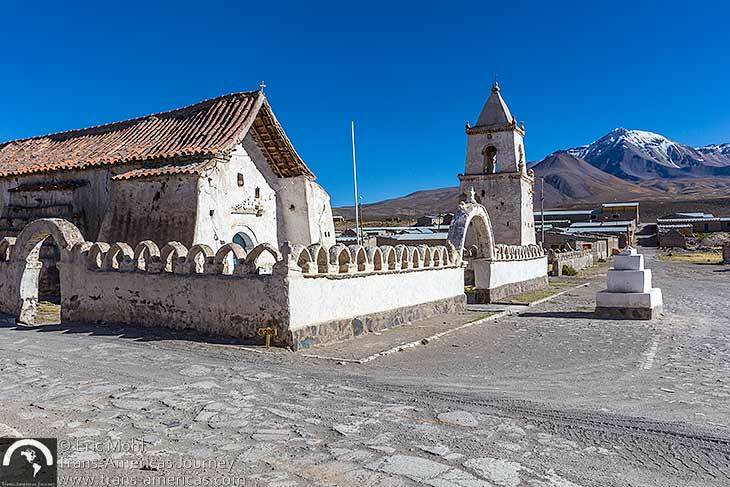 Iglesia Isluga, one of many historic churches in this area of Chile. 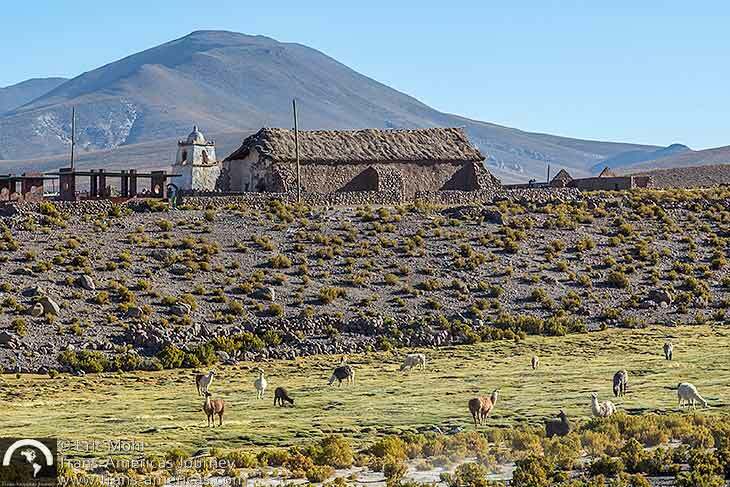 In 1981 an enormous area encompassing Lauca National Park, Vicuña National Reserve, and the Salar de Surire Natural Monument was designated as the Lauca Biosphere Reserve by UNESCO. This drive takes you through parts of that reserve as well as Volcán Isluga National Park. 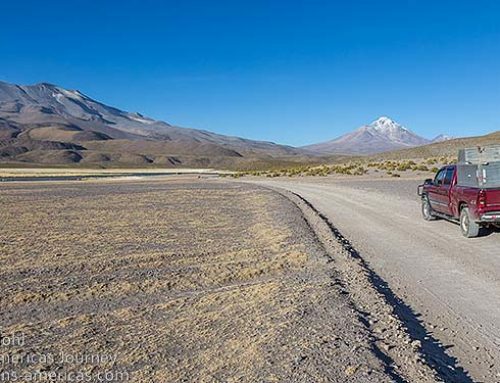 Driving through Isluga National Park in Chile. This route is 145 miles (233 km) driving directly between Colchane and Putre and can easily be completed on one day. However, there are a few diversions that can be made in the area. 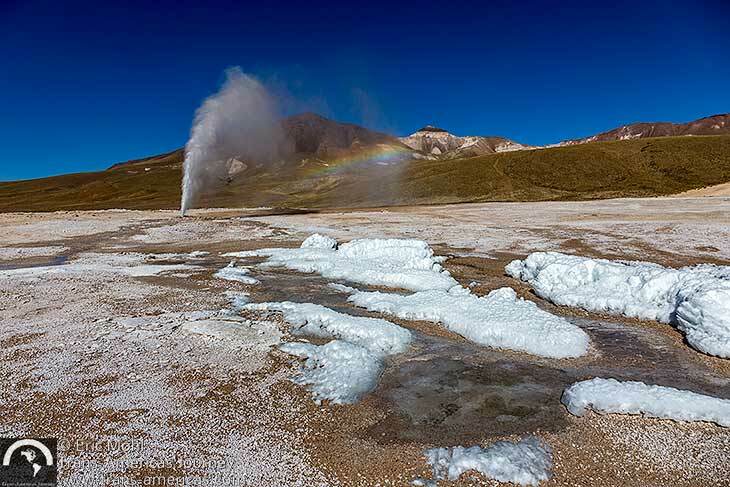 The most interesting is to the Puchuldiza Geyser (see 1:45 in our video at the end of this post) and we recommend doing this as a separate day trip before this trans-parks drive. Part of the Puchuldiza Geyser field. We went to the geysers on a scenic 78 mile (125 km) loop from Colchane and back in the afternoon before we crossed the park. Mauque church near the Puchuldiza Geysers. Leaving Colchane for Putre, we drove just a few miles then left the highway and entered Isluga National Park. The first site was the Isluga church (see 5:03 in our video at the end of this post). 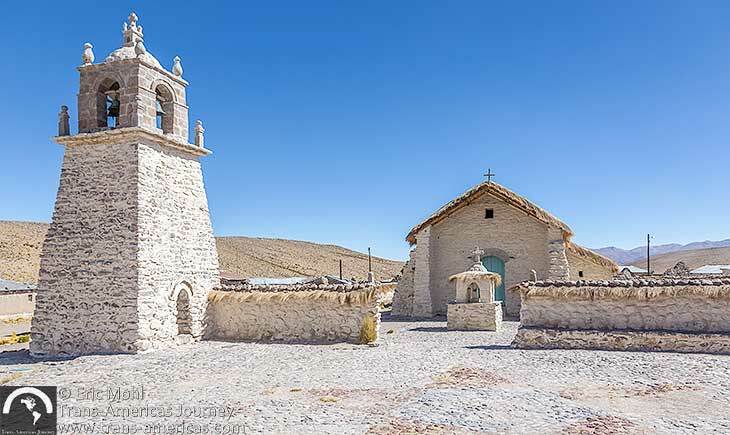 This church is seen on tourism posters throughout the region. 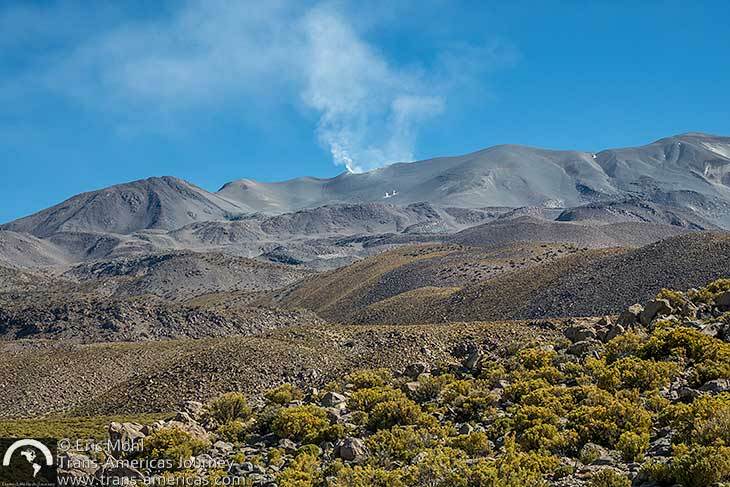 Then we passed the active Isluga Volcano puffing away (see 5:46 in our video at the end of this post). The active Isluga Volcano puffing away in the distance. 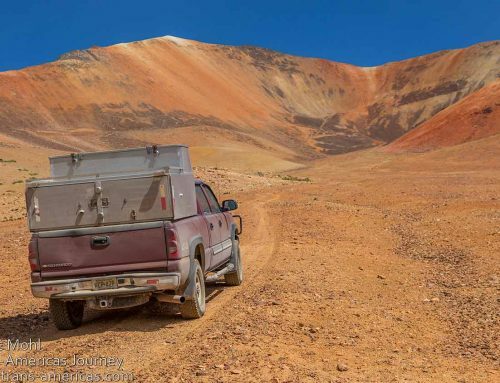 The first 40 miles (65 km) of dirt road out of Colchane, entering Volcán Isluga National Park, were in very good condition, but washboarding began in the section between the north end of Isluga National Park and Las Vicuñas National Reserve and our speed dropped from 30 mph (50 kmph) to 20 mph (30 kmph). Take the adjacent roads when they exist because they’re smoother. Suddenly, we saw wood and big rocks placed across the road and then a soldier popped out from behind a bush, pointed a machine gun at us, and motioned for us to stop. We put our hands in the air even though he didn’t ask us to do that (see 7:30 in our video at the end of this post). Then the soldier walked over and four or five other soldiers appeared from behind bushes, also with very big guns. 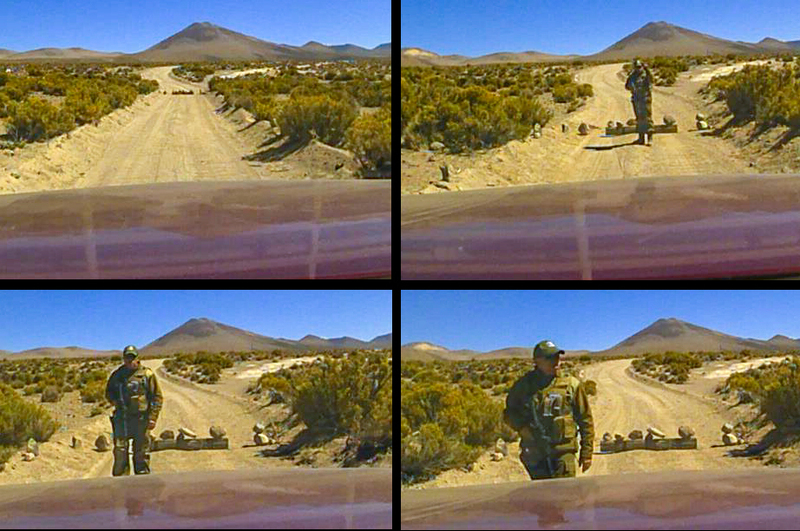 The first soldier told us to put our hands down, then explained that this route is very close to the Bolivia border and the soldiers explained that cross-border smuggling is a problem in the area. He checked our papers and let us go, but told us that the short route to the hot springs (which actually dips into Bolivia) is closed. He even claimed that the military had cut the route. A small church we passed in Santa Flor de Parajalla shortly before we hit the military check point. So, we had to take a different route to the hot springs which was about 16 miles (25 km) longer and climbed up to more than 15,550 feet (4,740 meters). On the plus side, the road was in slightly better condition and the scenery was gorgeous (see 8:20 in our video at the end of this post). About halfway up to the high point, we passed another soldier. 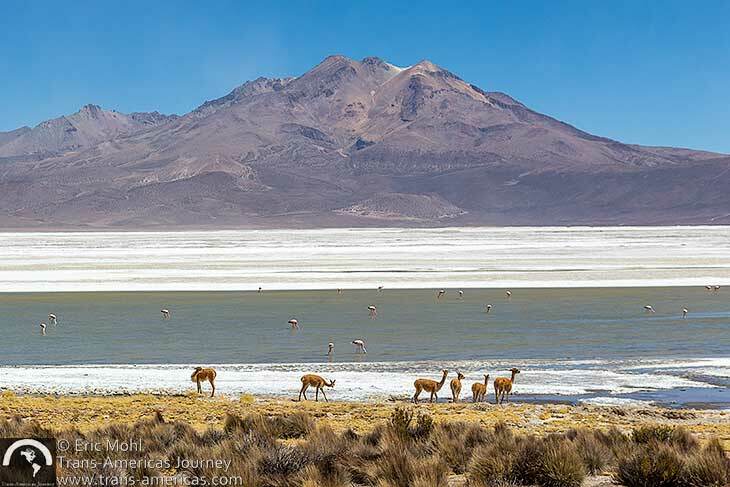 Vicuña and flamingos on the Salar Surire. 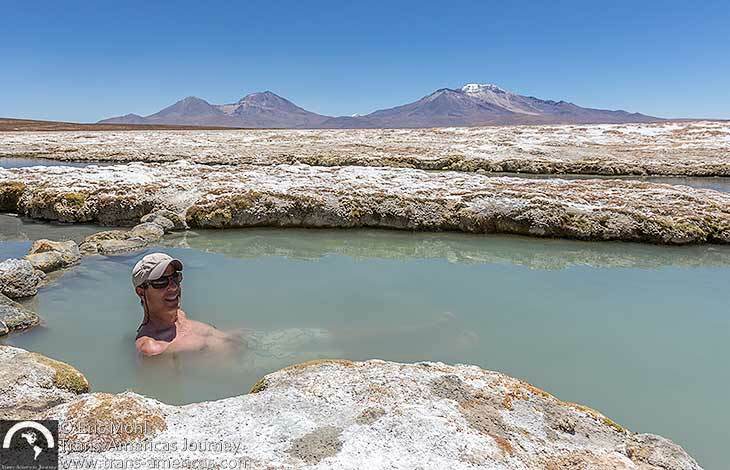 Then we entered the Las Vicuñas National Reserve and the Salar de Surire Natural Monument and about four hours after we left Colchane we arrived at the Termas Polloquere natural hot spring on the edge of the salt flat (see 10:05 in our video at the end of this post). 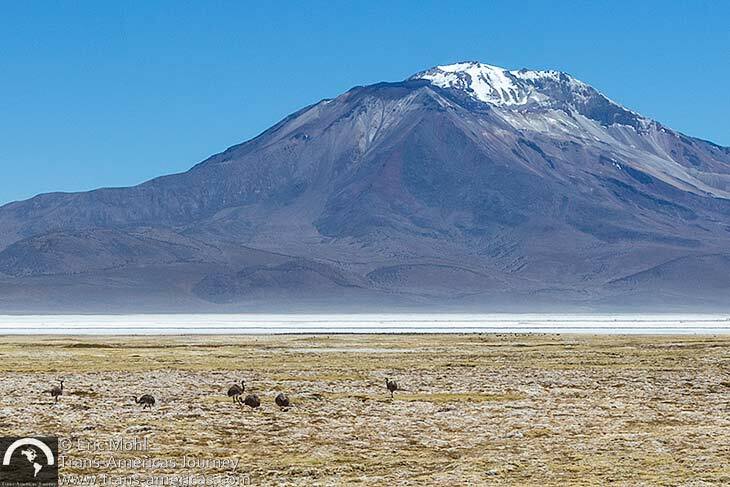 Lesser Rhea (an ostrich-like bird sometimes called Suri or Ñandu) on the Salar Surire. The thermal pools are totally natural (no concrete) and there are no facilities there except for a picnic table enclosed by a low wall to give some protection from the wind. 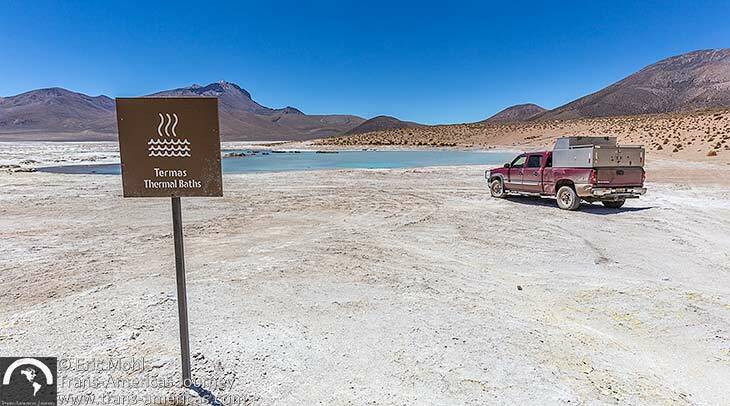 Our truck at the Termas Polloquere hot springs. The pools, which were about 2 feet (0.6 meters) deep when we were there, have a silty bottom and the water is actually boiling at the source of the spring, so don’t get in there. Flamingos and vicuña walked around in the distance as we soaked. Eric taking a mid-drive soak. 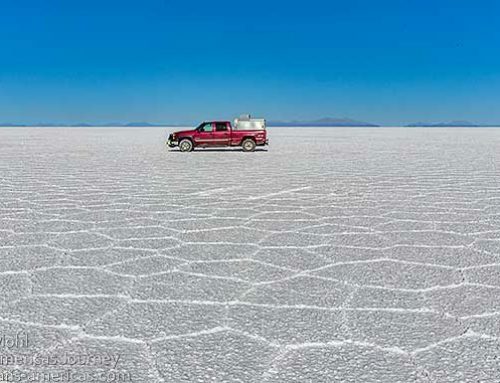 The road continued around to the north side of the salar (salt flat) where there’s a borax mine. From that point on the road was larger to accommodate the trucks but in places was even more washboarded from the truck traffic to and from the mine. We had read that there was a basic guesthouse in the town of Guallatire (see 13:48 in our video at the end of this post), but when we got there the owner said all of her rooms were full. Though we didn’t see anyone around except a couple of other locals we presume she was full with road construction crew members. Guallatire church in the tiny town of Guallatire. Luckily, it was early enough to continue on to Putre with a side trip (about 8 miles or 13 km each way) out a dirt road in great condition to see Saxra Marka, or Devil’s Village which was basically a tiny, sunken, white version of Bryce Canyon. 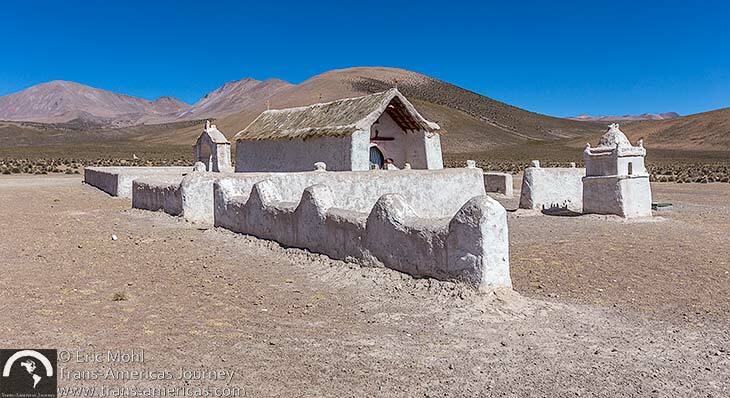 Devil’s Village was a bit of a letdown, but the scenery in the area was spectacular with llama and alpaca herds and snow-covered volcanoes. 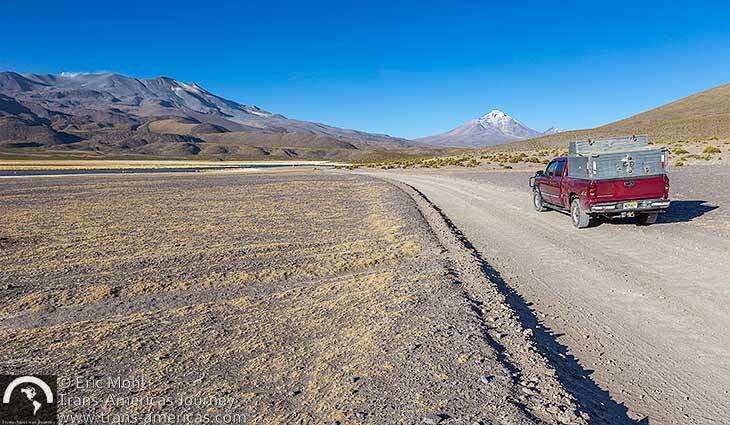 We back-tracked to the main dirt road which continues until it reaches paved highway 11 through Lauca National Park (see 17:22 in our video at the end of this post). 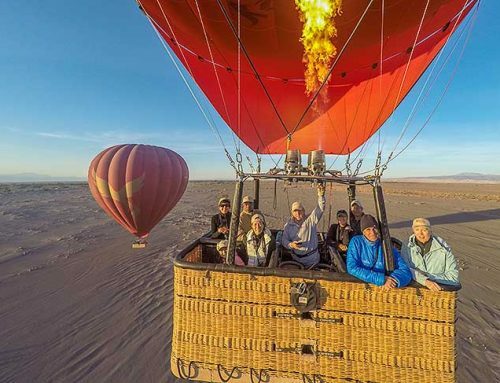 There are a number of things to see in and around Lauca National Park and a number of points of interest and short trails along the highway through the park. If time permits, plan to stop and stretch your legs before descending into Putre. 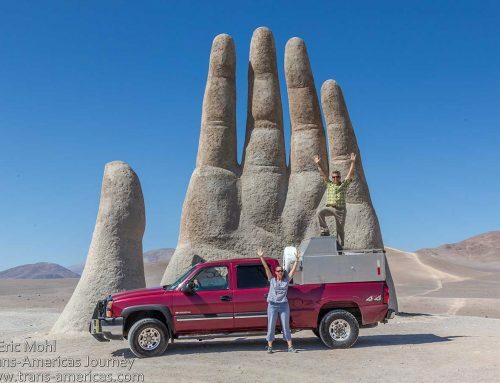 See what we saw through the windshield of four truck during this epic drive in Chile in our time-lapse video, below. Here’s what this epic drive looks like on a map. This whole route is fairly well signed, however, we recommend getting the excellent map of the area which was created by Flavio, the map-loving owner of Terrace Lodge in Putre. You can get it from him at the lodge in Putre, or buy a PDF of it online. Remember that you must be self-sufficient for fuel. There is no fuel available along the way, nor is there a gas station in Colchane or Putre. 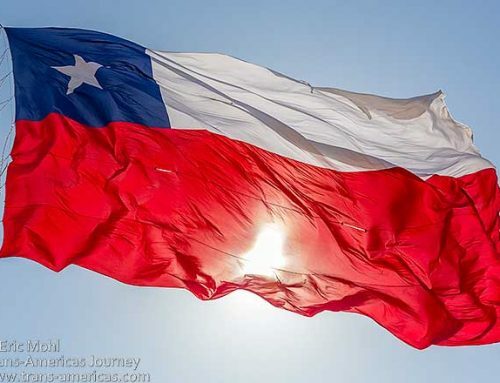 If you are starting in Colchane you have to fill up on the Bolivian side of the border or way down by the Pan-American Highway. 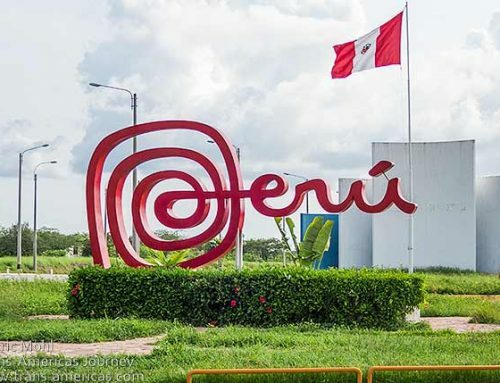 In Putre, Flavio from Terrace Lodge may have jerry cans of fuel available, but the nearest gas station is down towards Arica by the Pan-American highway. Unless you’re prepared to camp along the way, plan to do this drive in one long day since we can’t guarantee the existence of any accommodation on the route. The total drive, as described above, took us 10 hours including a stop to soak in the hot springs. We never encountered the need for four-wheel drive, though there are some sandy patches and conditions may be more challenging in wet conditions. Wow. Look at those blue skies. That gets me every time; seeing clear blue skies in these pristine parts of the world. I could do without smugglers and armed folks but usually this trade off happens in remote areas. If you want few folks and ample nature this tends to mean a bit of instability, in some cases at least. Looks interesting and photos are really beautiful. I guess you had great time!! what a beautiful places… I’m feeling happy after seeing this post… Because I love nature and you shared related images which I like more then any other-things…. Thanks for these. and I think you also enjoys these moments when you seen these places first time….